What if parents who quit smoking are engaging in antismoking socialization of children? Do they have better chances of not relapsing? In what ways is it helping them? For the first time, a study considers whether engaging parents in antismoking socialization of children after they quit smoking can have a beneficial effect on odds of relapse. Published on September 27th 2015, the study analyses the quitting smoking process of 689 parents. They began smoking daily at a mean age of 16 and were a mean age of 37 at baseline. One group of these quit smokers received the antismoking socialization program. At the end, they had twice the odds of abstinence 12 months post-baseline. How come? 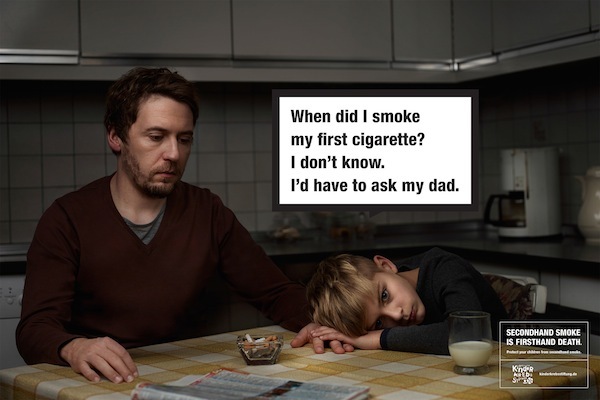 The program leverages parents’ expertise as smokers as it engages them in communicating with children about risks of smoking, about addiction, withdrawal and relapse. By acknowledging the power of addiction and the challenges of quitting and by explaining them to their own children, they are encourage and do better. This study represents a new approach that differs principally in that, from the participants’ perspective, providing antismoking socialization is viewed as a tool to prevent child smoking, not as a tool to avoid relapse. Indeed, all approaches to relapse prevention aim mainly to increase recent quitters’ ability to overcome cravings and resist triggers that could prompt relapse. These first results are very encouraging. Unfortunately, generalizability is limited by the study sample, which was predominantly female and highly educated and which focused on parents of 8- to 10-year-old children. Additional research is needed to replicate the effects observed in this study, identify the psychological mechanisms of effect, and identify attributes of smokers and families that moderate the observed effect. Such new relapse prevention strategies can be very useful since they have a double goal: they lower chances of relapse for parents but also lower chances of smoking for children.